In today’s news or sports reports it is common to see the faces of either President Donald Trump making news in sports for all the wrong reasons or the father of NBA rookie Lonzo Ball Lavar Ball. These two names have been the headlines of news for their respective reasons whether on twitter or through media influence and branding of his children in each case. All of that came to a head when these two brash and cocky individuals collided on the case of Lavar’s son Li Angelo Ball who was arrested in China for shoplifting a pair of expensive glasses along with two other teammates. Trump claims to be the reason for the UCLA basketball players release taking to twitter to look for credit in his role of getting the kids out of the prison. Trump displayed mediation and arbitration as a neutral third party to find a basis to have the kids released from the prison. Lavar on the other hand wanted nothing to do with Trump claiming his role was over-hyped in the freedom of the children. He also believed Trump’s warrant for thank you wasn’t necessary in his interview with ESPN saying “who?”, “What was he over there for?” When asked further comments on the situation Lavar declined to answer but also continued to deny Trump’s role on how the kids were able to come back to the states. Trump’s attempt to help the family with a deal with Lavar and the Chinese government. It did warrant a thank you if Trump did play a role in the release of the kids but the ego of Lavar seems to refuse to let anyone get the upper hand on him. This later resulted in a response from Trump saying that he should have let the kids sit in jail. Trump later did receive a thank you from the three basketball players at a press conference held by Ucla. Donald Trump’s actions showed a sense of integrative agreement in which he could put himself in the spotlight as a public hero to the world and by saving Li Angelo and the other two kids from a hefty jail sentence would do the Ball family a huge favor. 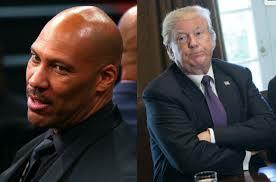 In this case it ultimately did not turn out the way Trump wanted do to the character of the man he was dealing with in Lavar Ball who is never afraid to stand up in front of a camera and say what he wants to say. In my opinion I believe that these two men let their pride take over when it comes to what they do. Everything move they make today is viewed in the public and they seem to love the attention and making sure people know what they are up to. They are both going to be attracting this type of noise whether as the president or the NBA in terms of media. The two of them made sure they made headlines together when it came to this recent collision course.